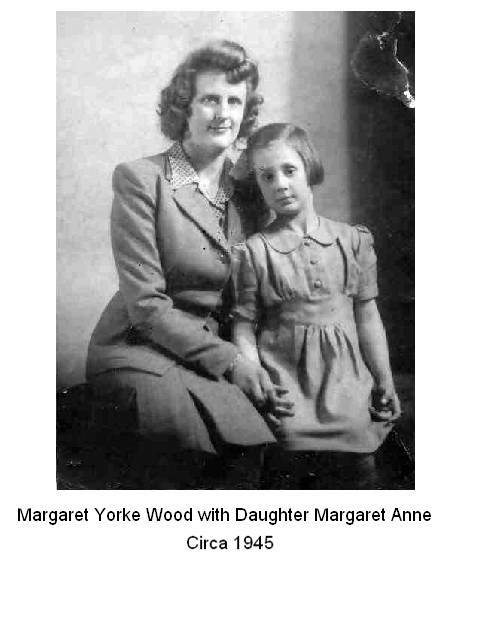 Margaret York Broadbent (pictured with her mother) was born on the 4th September 1916 at Well-i-hole, Greenfield, Lancashire. 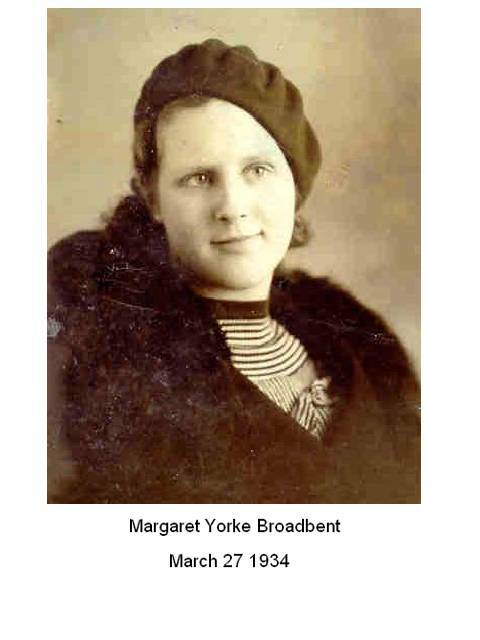 Her father was Walter Wrigley Broadbent, who was a was a commercial Clerk at the local mill. Her Mother was Lilian MacGregor Yorke (known as Queenie), a nurse. She had a younger sister; Sheila MacGregor Broadbent. Back row: Margaret Broadbent, Queenie, Mansell Davies, Sheila Broadbent, Victor Willis. Front Row: Patricia Willis, Walter Broadbent (with Bronwen Davies), Margaret Wood & Winifred Yorke. 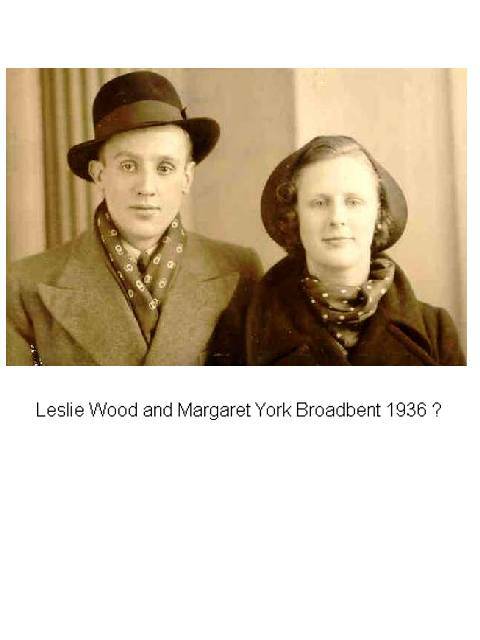 Margaret Broadbent married Leslie Wood on the 1st of May 1937 at Friezland Parish Church, Yorkshire (shown below left). 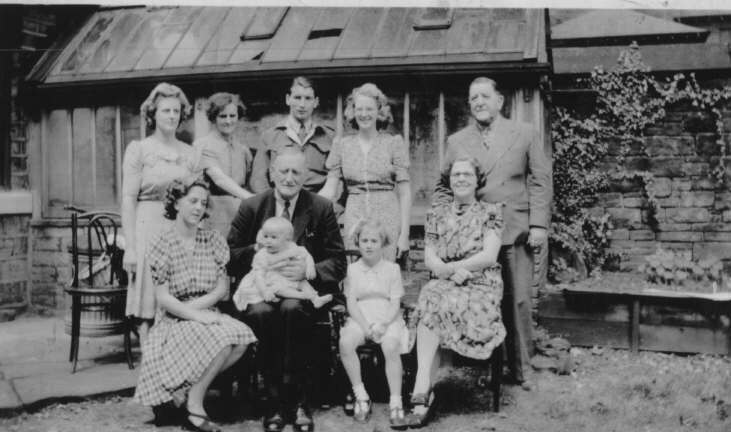 Leslie was born in 1913 and worked as a Joiner, he was the son of Spencer Wood a Fitter from 1 Berry Street, Greenfield, Lancashire (shown below right). Margaret was living at Birch Nook, Greenfield at the time. Lilian Broadbent signed the marriage certificate. On the 13th of June 1938, Margaret Anne was born at the District Infirmary. The family was living at Annisfield Avenue, Greenfield at the time and Lesley Wood was employed as a Journeyman Joiner. He also served in the Coldstream Guards for six years, serving abroad for much of that time. Margaret Anne married Fred Robert Mason Barrow on the 15th of April 1963 at St Mary's Church, Greenfield, Yorkshire. Fred was born in 1938 and worked as an electrician, he was the son of Fred Barrow, also an electrician, from 110 Union Street West, Oldham, Lancashire. Margaret was living at 50 Annisfield Avenue, Greenfield at the time. Lesley Wood was described as a joiner on the wedding certificate. The Barrons emigrated to Canada soon after their marriage and lived in Toronto. They have three daughters. In the late sixties, Margaret & Leslie Wood also emigrated to Canada where they died, Margaret in 1999 and Lesley in 2001.